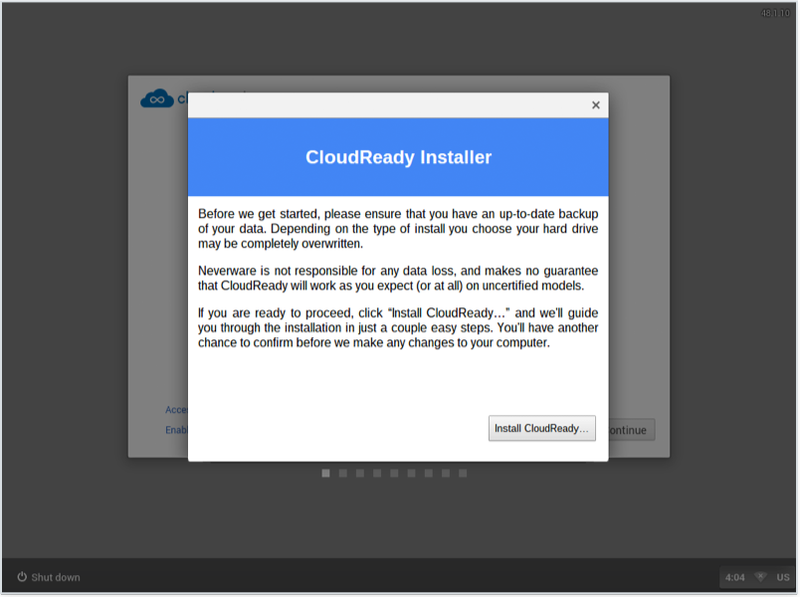 To permanently install CloudReady on the computer you choose, each computer needs to start or "boot" from the CloudReady USB installer that you created. This is called USB booting, and all computers models certified to work with CloudReady are capable of it. 1. Make sure the chosen computer is turned off. 2. Plug in the USB installer that you created previously. Dell Tap F12 when the Dell logo is displayed. HP Tap F9 when the HP logo is displayed. Apple Hold Option (next to the ⌘ key) when the computer first turns on. Other Try tapping Esc, F1-12, or Enter during bootup. 2. A small menu will be displayed on your screen. 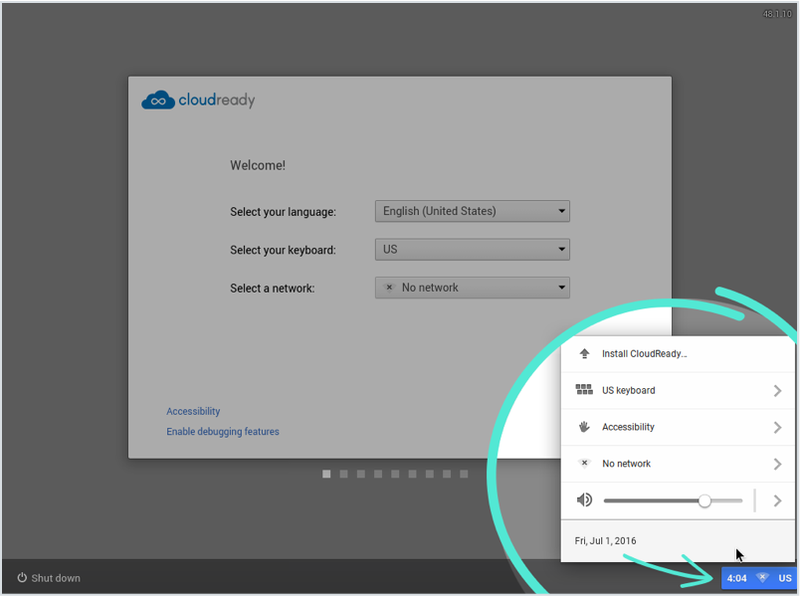 Use the arrow keys and enter key on your keyboard to select the CloudReady USB installer. Depending on the specifics of your machine, your USB installer will be described on the menu as "USB device", "USB storage", or a name that matches the brand of the USB flash manufacturer. 3. 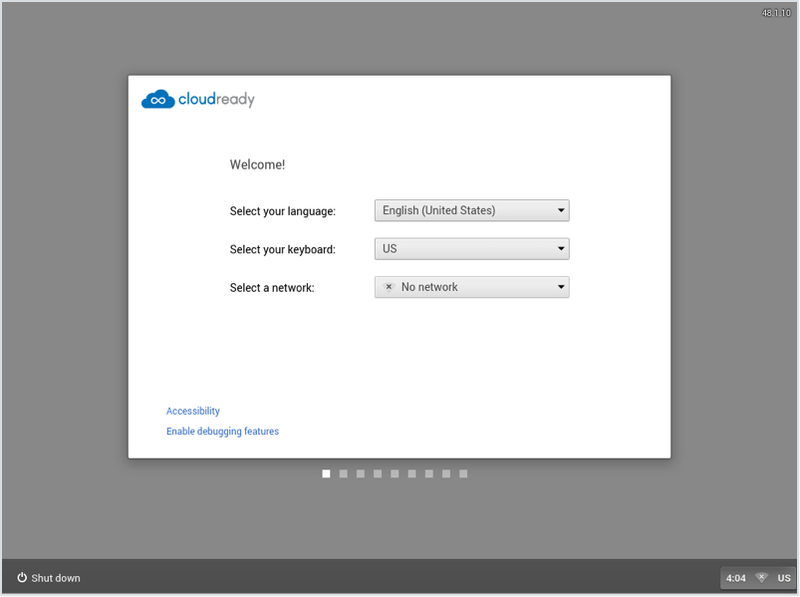 When your CloudReady USB installer has finished starting, you will see a network configuration page. 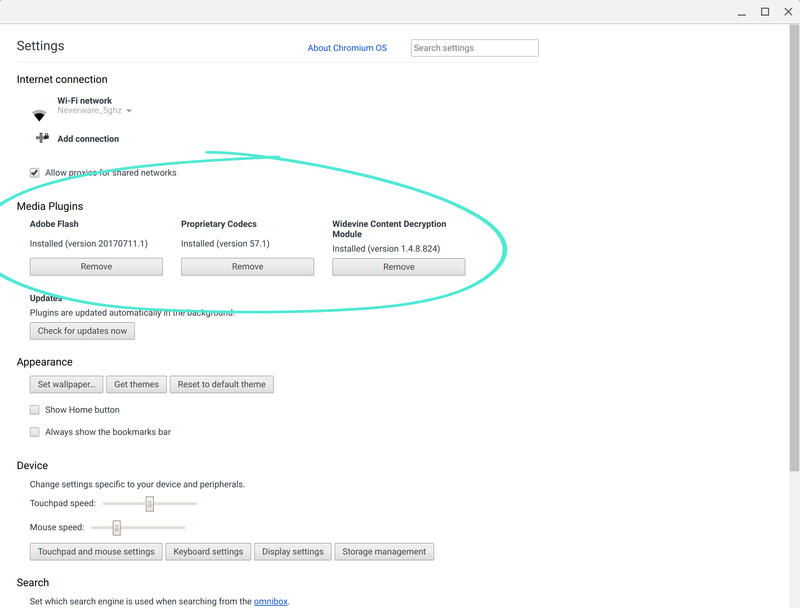 You can ignore the configuration box at the center of the screen - you do not need to configure networking before installing CloudReady. 4. Click on the clock at the bottom right-hand corner of the screen. 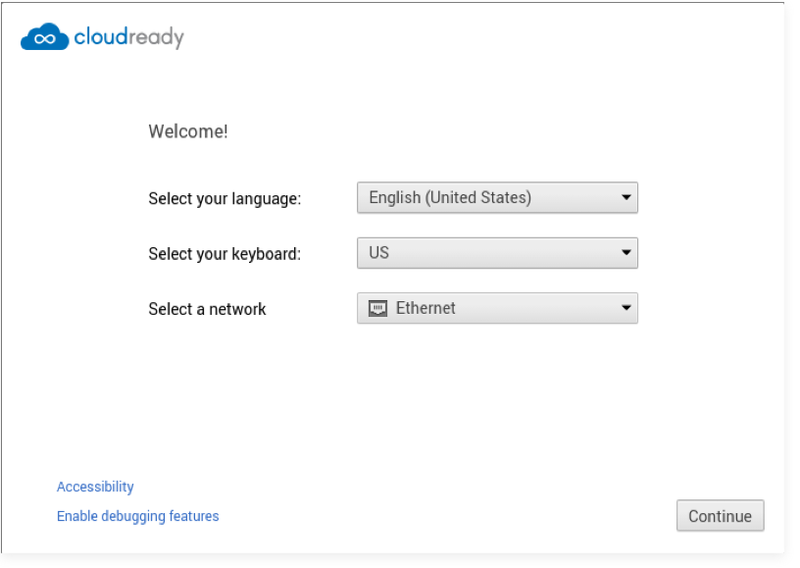 On the menu that appears, click the first option: Install CloudReady. A wizard will pop up to walk you through the installation process. 5. Click Install CloudReady. Once you read and agree to all warnings, the installation process will take 15-30 minutes to complete. After installation, you will be presented with the same setup menu as Chromebooks, where you can set language, keyboard and network preferences. Once you are connected to an ethernet or WiFi network, click Continue. 7. Your machine will check for updates, and then present you with the standard Google login screen. Before logging in, check if you need to enroll you device by proceeding to step 8 below. You can now log in! Your username must be a gmail.com address, or a Google domain registered through the Google Admin Console. 8. If you wish to enroll your CloudReady machine in the Google Management Console, pres CTRL-ALT-E before logging in for the first time. You will then be prompted for credentials for enrollment. You can read more about enrollment here. Adobe Flash - used by many websites to provide interactive multimedia content. Widevine - a DRM and content protection platform used by streaming video services such as Netflix. Proprietary media components - support for audio formats such as .mp4. 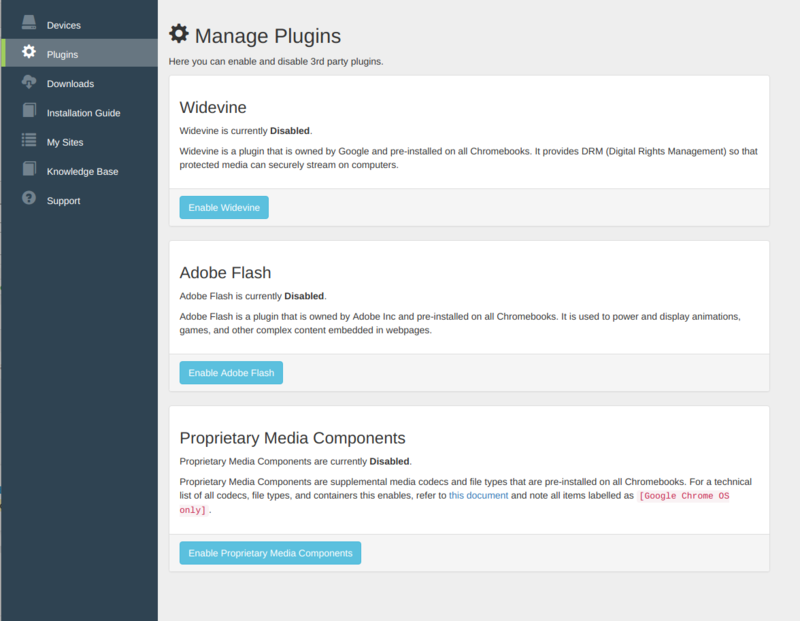 For a full list, see the detailed Chromium documentation. If you are deploying CloudReady for your organization but do not know how to access my.neverware.com, please contact Neverware Support.